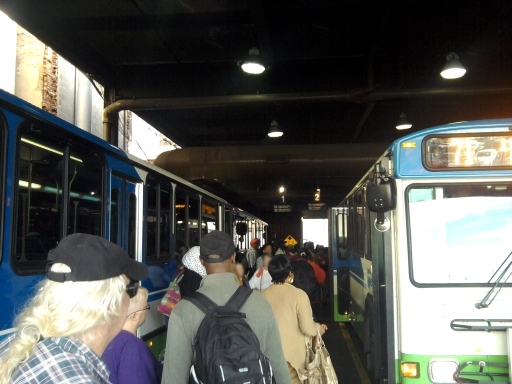 A well-traveled public transit system can resemble a networking session at a conference. Plenty of opportunities for networking and information exchange. Economic Efficiency – The neoclassical model of economics presupposes, among other things, that all relevant information for market decisions and market opportunity is readily and freely available. In the complex world that we live in this is easier said than done. This is especially true if we are isolated and alone for our commutes. Carpooling, vanpooling and public transit offers the possibility to network and make connections. You can think of this as your own mini-conference or business meeting on the way to work. Economic Growth – Economies can often grow when business and economic activity between suppliers and customers increases within a given geography. In general the ability for a business to capture benefits when it locates among other businesses is called “Agglomeration Economies.” When the supply chain relationships between numerous businesses are concentrated and well defined we often call them “Clusters.” Public Transportation can serve such industrial clusters by opening up a wider labor market to the businesses involved. Sometimes those who are in the market for a prevailing wage, let’s say $10 per hour for argument sake, live in another part of the urban area from where such jobs are offered. For instance, these jobs may be in an economic development or industrial park and job candidates may not have reliable transportation to get between the two. When this happens we say that there is a “spatial mismatch.” Public transportation can help businesses grow by addressing this spatial mismatch and delivering the employees that a growing business needs. Please see the recent RCIT/Blue Hills Transportation Survey Analysis Report for more on these topics. Process and/or Technology Development – The economist Joseph Schumpeter articulated the concept of “Creative Destruction” by which new business processes and technologies displaced older less efficient processes and helped lead to economic development through entrepreneurialism. New process and technology ideas often come about through deep reflection on experience and/or by the cross-pollination of ideas by people in different businesses and industries. Often the process is a combination of both in mutually-supportive economic environments. Public transportation can provide the time to read, reflect and think that is important to this process. This is easy to observe in large urban areas such as the Washington DC metro area where many catch up on reading or work on the metro. Likewise, public transportation can provide the fertile ground for the cross-pollination of ideas through networking and conversation similar to that experienced at a conference. Finally, public transportation can be a place of creativity in general as is being demonstrated in the ongoing “Art by Bus” project. Who knew that public transportation could accomplish so much for economic development? The benefits can accrue even if you only carpool, vanpool or take transit once a week. A longer list of employer benefits can be found here. This entry was posted in Transportation and tagged Economic Development, alternative transportation, economics, public transportation, carpooling, vanpooling, networking, public transit on March 17, 2015 by admin. A seemingly common measure of effective public participation, in the context of developing a public plan or program, is the number of people who attend a public meeting or hearing in the presence of a governing body, board or commission. Oftentimes planners and elected officials are concerned with the lack of comments or speakers present during periods of public comment, and tend to deem the endeavor unsuccessful. This often happens following robust public outreach campaigns (i.e. direct mailings, focused stakeholder meetings, newspaper articles, website postings, social media, videotaped meetings, etc.). So where is the problem if the public fails to provide public comment in person or in written form? Is there pervasive public apathy and indifference towards public plans and processes? The short answers are: 1) A “problem” may not actually exist; and 2) In this growing technological age, there are more opportunities and outlets from which to solicit and provide public input. This article will support the position that public plans and programs can be deemed successful without last minute public feedback at public hearings. As an example, the Transportation Improvement Program (TIP) is a four-year financial program that describes the schedule for obligating federal funds to state and local projects. 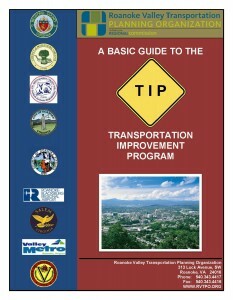 The TIP contains federal funding information for all modes of transportation including highways, transit and pedestrian facilities. 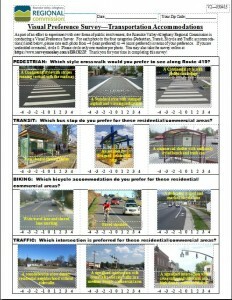 In 2014, the Roanoke Valley Transportation Planning Organization (RVTPO) held a public comment period (advertised in the local newspaper, social media and RVTPO website) prior to the public hearing held by the TPO Policy Board. Access to the draft TIP was made available electronically or by paper copy. Blog posts were written and posted on the TPO website and Facebook. Additionally, a Basic Guide to the Transportation Improvement Program was developed to give the public a fundamental understanding of the TIP process and project selection. After all of the opportunities to provide input, staff received one e-mail comment, which incidentally was a 100 percent increase over the previous TIP! Additionally, no one was present to speak at the TPO’s public hearing. Did staff perform their jobs correctly in the development and execution of the TIP? Yes. Was this an example of a project that did not require public hearing feedback or comments to legitimize its effectiveness? Yes. In conversations with the public, this writer has found that people do read draft plans, check updates on project websites and generally understand their content. When questioned about a plan, many will express satisfaction or contentment with the content–with some inquiring about specific subject matter. Bear in mind, such input was solicited and not volunteered. From these types of conversations and interviews with the public, a picture begins to materialize–one of quiet success and consensus. For years, the standard bellwether of good public input was standing-room-only rooms or filled sign-up sheets at a public hearing. In most cases, the crowds were there speaking in favor or opposition to a controversial topic. Attending many public hearings, one can clearly see a trend among concerned citizens to mobilize or band together, which strengthens and varies directly with the controversial nature of a plan/program. Despite visible and vocal public participation on a controversial subject at a public hearing, the level of citizen involvement, understanding and participation by those not participating at such meetings is not so starkly less. This is why, it is asserted, that many citizens choose to become involved earlier in a public process, providing valuable and tangible feedback which contributes to the final plan’s/program’s outcome. Other reasons for increased attendance at public hearings arise when there are misconceptions, misinformation or a general disconnect regarding a plan or program. This is sometimes resolved at a public hearing through discussion and interaction with staff. As planners, if we apply this logic to these situations, could it not be argued that our effectiveness is measured in terms of how few comments were received? Conventional wisdom regarding the benefits of public hearings suggests they are a forum through which new ideas and points of view are presented. Given that many public hearings are first-chance last-chance opportunities to provide comments, the introduction of new ideas seems grossly untimely. It would seem somewhat of an uphill task to persuade public bodies to consider taking a new direction at the very end of a process. Naturally there are public processes designed to engage and solicit public preferences and data. With technology and industry tools ever changing, online surveys, design charrettes, visual preference surveys and mapping exercises seek and achieve effective public participation. By engaging the public from the beginning, allowing them to help shape the plan or program, effectiveness skyrockets. This technique not only educates and informs, but publicizes a project, sometimes more than conventional methods. Some public projects obviously do not require public hearings as part of their processes. Such projects, however, can be heavily reliant upon public input. This input takes the forms of surveys, public brainstorming sessions, and interactive/visual exercises to determine needs and preferences. As an example, staff of the Roanoke Valley TPO met with business leaders from an industrial park who were concerned that existing and potential employees were not being adequately served by the public transit system. Following several meetings, staff developed a survey to be administered by employers and available online. The response rate exceeded 25%. The results of the survey were conveyed to the business representatives, and several meetings were held with local economic development and transit officials, who recognized the public need. The project is still ongoing, but it was fueled by public involvement and participation. The coordination and communication with a variety of stakeholders, throughout the process, insures efficiency on the part of the public agency and its employees. Planners and elected officials should feel confident that initial and ongoing public participation efforts are paying dividends by the lack of plan and public hearing comments at, essentially, the end of the process and just before legislative action. Employing various public interactive meetings, charrettes, surveys and the like, to inform and educate at an early stage, will continue to yield low turnout at required hearings. Attendance by public officials at such events will positively reinforce their opinions about participation levels. Are citizens on the whole bored, indifferent and unengaged in public processes? No. Please share any thoughts, comments, or experiences you have with public participation efforts. In addition, as part of public engagement and input towards the RVTPO Constrained Long-Range Multimodal Transportation Plan, this Visual Preference Survey was designed to gather public preferences on different types of transportation infrastructure. Please click on the image to take the survey. Thank you for your participation! This entry was posted in Transportation and tagged Pubilc Participation, Public Hearings, charrettes, public meeting, public comment on March 6, 2015 by Bryan Hill.